Batter up! We’re in for a good one today at the ballpark. Use targets and the hit ramp to score a home run, but don’t strike out! If you are really good, you can become an All-Star player. Reactivate: light all 3 left targets. Also reactivates on lost ball. Reactivate: light all 3 right targets. Also reactivates on lost ball. Pin at base of outlane scores 25K points. Proceed to a higher multiplier by doing it again. 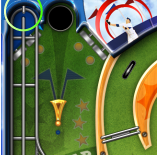 OK, Slugger, aim for the Hit Ramp to scores lots of points with hits and runs. No matter how well you swing the bat, or flipper as the case may be, if the Hit Ramp is set to FOUL or CATCH, you won’t get on base. Center targets control the status. 0 -1 targets or 4 targets lit: SAFE status so smash it up the ramp. 2 targets lit: even a line drive up the ramp will be a FOUL ball. 3 targets lit: outfielders won’t drop this CATCH. When the SAFE light is on and the ball is in your strike zone, swing for the fences – bigger hits earn bigger points. If the ball doesn’t make it around the ramp for at least one full circle, it’s a foul ball even if the status is SAFE. After a hit, check the field for runners’ positions. Each strike capture scores 10K points. Strikeout with 3 captures and score an additional 30K points. It’s a CATCH when there is a runner on third and the ball goes around the ramp more than once, but not quite twice. Hit bumpers to give more oomph to your swing. Each 10 bumper hits increases the speed up the ramp by 1, maximum of 4. Resets when the ball goes up the ramp. Works for all Hit Ramp statuses. Just like on a real grassy field, strikeouts and catches are Outs. And 3 Outs ends the inning. All runners leave the field at the end of an inning. 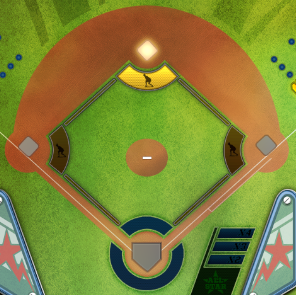 New batter starts with the Hit Ramp Status back to SAFE at the beginning of a new inning. A runner on first or second if there is no runner on the next base. A runner on third base can steal home. Light the entire right target set 4 times to steal. Each lighting of the entire set scores 90K. Stealing second or third base scores 250K points. Stealing home scores 500K points. If there are runners on first and third, only the third base runner steals. Turn a Double Play and score 300K points. Light the entire left target set 4 times to turn the Double Play. Turn a Triple Play and score 600K points. 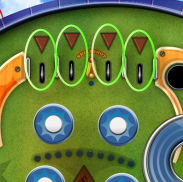 Light the entire left target set 4 times to turn the Triple Play. Warm up in the Bullpen and you’ll be ready for a multiball. 4 Bullpen captures adds a ball into play. Left outlane if it is activated and open. Left ramp. The ramp feeds to the flipper after one trip to the Bullpen. A hit to the pin at the top of the ramp will reopen access to the Bullpen. Each Bullpen capture scores 25K points. Batting practice can only help the final score. 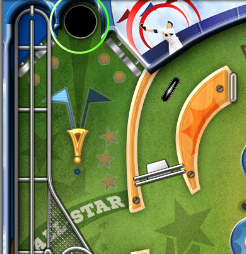 Capture the ball 3 times in the All-Star hole to access the Batting Cage. Each capture scores 35K points. In the cage, practice your swing on 6 pitches. 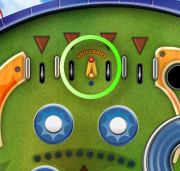 When any multiball is triggered, progress toward the Batting Cage is reset. Only the best end up playing as All Stars. Earn 3X regular points while mode is active. Light the entire All-Star target set 3 times to trigger the mode. Each lighting of the entire set scores 150K. The mode lasts for 45 seconds. It wouldn’t be baseball without a hefty does of superstition. 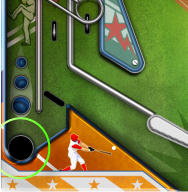 Capture the ball 4 times in the Curse hole to trigger a baseball curse. Each capture scores 20K points. Remove the curse to score an additional 200K points. Curse of the Bambino – you don’t have to have Babe Ruth on your team to remove the curse. Just make 15 target hits. Curse of the Billy Goat –get 20 bumpers hits to get rid of this jinx. And be nice to goats. The San Diego Curse – 8 poles hits will exorcise this curse from your game, if not from the city itself. Trigger and remove all three curses one time and score and additional 1M points. Comments? Questions? Contact us at support@madeofbits.com.